Looks exaclty like the pictures! I’m 145 lbs, 5’ 7”, 34C and ordered a large! Comfortable and of quality material! I love the bottoms because they don’t pinch at the “muffin-top” area! 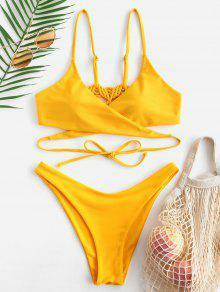 This yellow is very trendy! The top is great for making sure it will fit you. The color is also really great.